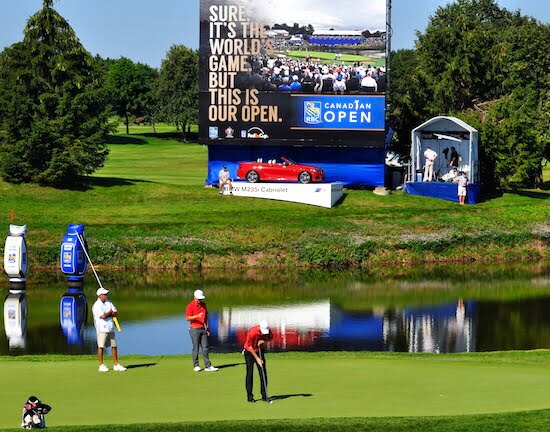 OAKVILLE, ONTARIO — As the Pan Am Games wind down this weekend, it’s now time to shift Toronto’s sporting spotlight and focus on the RBC Canadian Open, the pinnacle event in the realm of Canadian golf. This year’s championship has returned to the esteemed Glen Abbey Golf Club, Canada’s most famous golf course, in Oakville, 30 minutes by car west of Toronto. Glen Abbey is a golf course near and dear to my heart having worked there for years and played the course more times than I can count. Trust me when I tell you I’ve never seen the course in better condition. This year marks the 106th anniversary of one of golf’s oldest championships and the 27th time Glen Abbey has hosted the best golfers in the world. Built specifically for this event, the course will also host the 2016 tournament. The pros will compete for a share of the $5.8 million US purse with over $1 million going to the 2015 champion. What makes the Canadian Open special is you don’t have to be a golfer to enjoy it. Simply being there is an exhilarating experience. If you attended Friday’s opening round you would have witnessed “Red and White Day,” when spectators and some players — including Aussie Jason Day — dawned Canada’s colours from head to toe. If you’ve never been to a Canadian Open you’re in for a treat. The field of players is the best in years and includes two-time Masters’ champion Bubba Watson, two-time US and British Open champion Ernie Els, and two-time Canadian Open champion Jim Furyk. Top Canadians Graham DeLaet and David Hearn are two of 16 Canucks hoping to do something that hasn’t been done in more than 60 years — win the Canadian Open, a feat last achieved by Pat Fletcher in 1954. 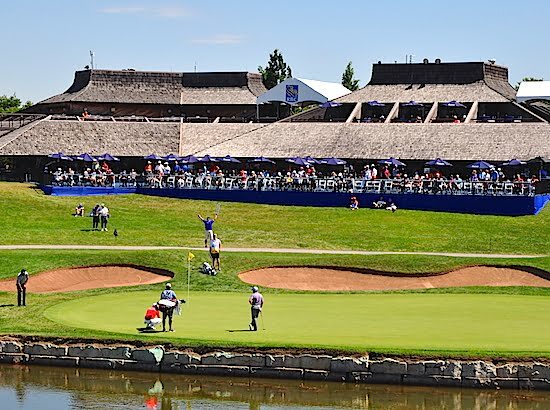 So what should you do this weekend when you go to the RBC Canadian Open? My recommendation is to check out the driving range first and watch some of your favourite players warm up. In all likelihood, you’ll probably get an autograph or two. Afterwards, you can do one of two things. If you’ve never been to Glen Abbey before, I suggest walking the entire golf course and seeing all 18 holes. Be prepared for a long haul especially as you descend into the valley, which features holes 11 through 15. This is the best part of the course and worth the walk and extra effort. If a 7,000-yard or five-mile trek is closer to a week’s worth of exercise, the more leisurely alternative is to find a place on the course and let the players come to you. On the front nine, there are two locations where you can park yourself. The first is behind the first tee. From here you can see everyone tee off and start their round. Immediately behind you is the sixth green. I also like the hill behind the fourth green and fifth tee. Again, you’re in the ideal place to see continuous action as you’ll be able to watch two groups of players throughout the day. On the back nine, the best place to grow roots is behind the 14th green and 15th tee. From here, you can move freely back and forth between holes. It is behind the short par-3 15th hole that you will feel like you’re standing on the tee and rubbing shoulders with the players. On Sunday afternoon there is only one place to be and that’s somewhere around the perimeter of the 18th green. This is the signature hole at Glen Abbey simply because some of the best finishes in golf have happened here over the years. It’s what Jack Nicklaus envisioned when he designed Glen Abbey nearly 40 years ago. One of the best shots ever hit happened here in 2000 when Tiger Woods launched a 213-yard 6-iron from the fairway bunker over the water resulting in a one-shot victory over Grant Waite. In 2004, the finish was equally exciting as Vijay Singh had the nerve to defeat Canada’s own Mike Weir in a playoff that concluded on the venerable 18th hole. The stage is set this weekend for another exciting finish. Tickets are readily available and can easily be purchased through the tournament’s website or at the front entrance upon arrival. Kids under 17 get in for free all weekend. How many other sports do that for kids? While golf may be the world’s game, this is our Canadian Open. As I said, you don’t have to be a golfer to enjoy one of Canada’s most storied sporting events. Just come, sit back and let the action come to you.